Since past few years we have discerned that A.M.C. 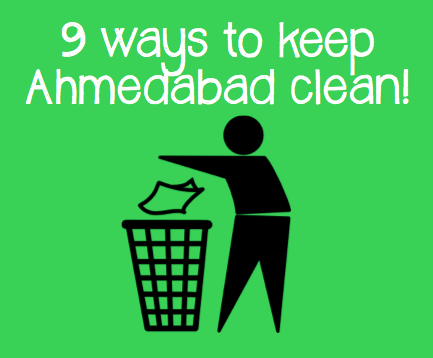 is trying diligently to keep Ahmedabad clean by adopting the motto of “Clean Ahmedabad, Green Ahmedabad”, but as we all know that cleanliness of a city also depends equally on its denizens too and that made me question myself that are we Amdavadis really playing our part conscientiously or not because we still find people throwing garbage haphazardly on streets or urinating on the road or spitting tobacco on the walls. As it is known that the main aim of education is to make us a better human being but I really doubt that motive because though we are so called “educated” people we still find ourselves guilty when it comes to carrying out a simple moral duty of keeping the city clean. I am sure that many a times you have avoided throwing the wrappers or any other waste in dustbin just because you had to walk some length for it or you haven’t stopped one of your family’s elderly or friend from throwing waste or spitting on the road just because you thought that it was not your concern or you haven’t tried to take a stand in front of your mother when she was throwing garbage on the street while she thinks that her only responsibility was to keep your house clean. When you are traveling by car or bus, or are walking on the road then kindly refrain throwing any wrapper, paper or any dry waste. Keep it in your bag or pocket. (Stop being a slob and don’t you dare think that it just won’t matter because no one is watching you!). Avoid spitting on roads (As it can lead to viral diseases and am sure you don’t want your family or friends or even you to fall prey due to your laxity!). Currently Ahmedabad is ranked 19th in terms of cleanest cities and I don’t think so it takes too much effort to simply follow some simple rules and see Ahmedabad rank 1st on the list!